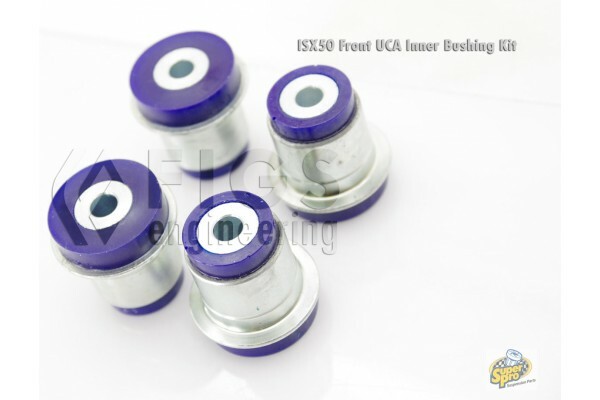 These bushings replace the staked rubber bushings on the Front Upper Control arms of the ISX50 platform and the Gen3 GS. Set includes 2-Bushing sets for to replace both arms. A bearing C-Clamp is strongly suggested for ease of install. A bearing clamp service tool to access the area behind the knuckle to remove the old bushings. Unbolt UCA via two inner bolts and separate the outer ball joint with a ball jount separation tool. Support spindle with a coat hanger or tie down to the shock body. Remove old bushing via any means possible but most effectively using a bearing clamp. Lube new poly bushing and press in first, fill voids and coat the lead in transition. Remount the UCA and retorque ball joint and inner bolts.